Topics: FPP School Donation Program, Olympus OM-1 35mm Camera, Super 8 for Summer, Book of the Month and More! 0:11:42 Letters accompaning donations to the program. 0:30:33 Camera: Olympus OM-1, Leslie Lazenby's extensive coverage. Hey, we're back! It's the Internet Radio Show for people who love film! Today joining Michael Raso in Studio is Leslie Lazenby, Mat Marrash, and Mark O'Brien! 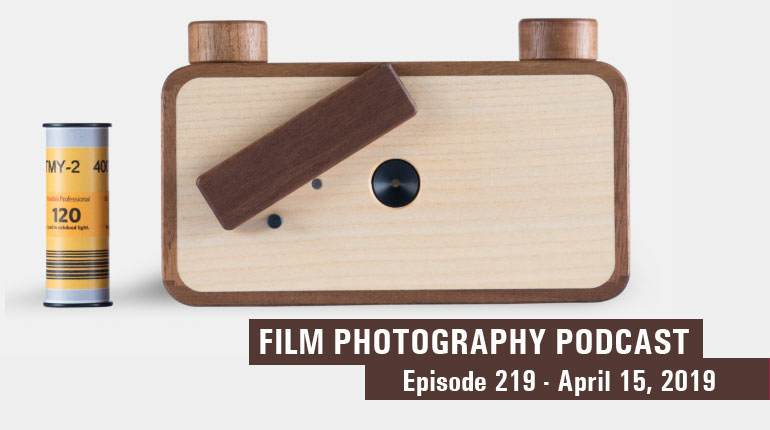 On today's show, our topics are the small but powerful Olympus OM-1 35mm SLR, our School Donation Program, Super8, Listener Letters, Book of the Show, Listener Letters, and so much more! So grab a Mr. Brown Iced Coffee, kick back and stay tuned! 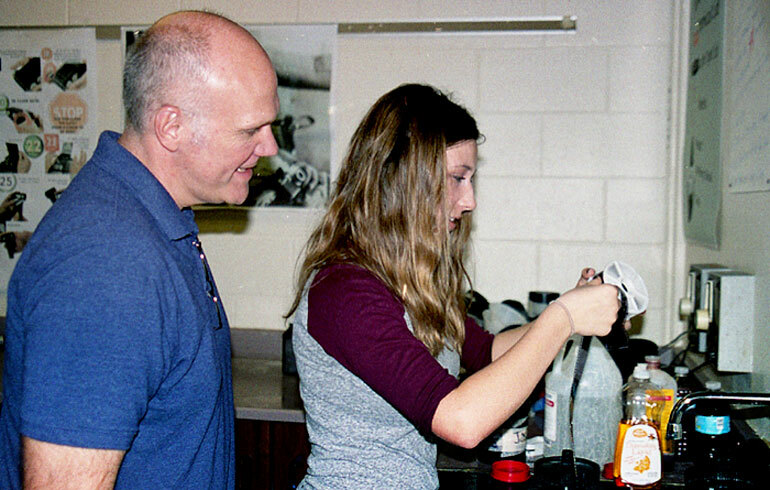 above: Mr Dan Yeager instructing one of his many film photography students at Pickerington High School Central in Ohio. The School Donation Program - Bigger than Ever! 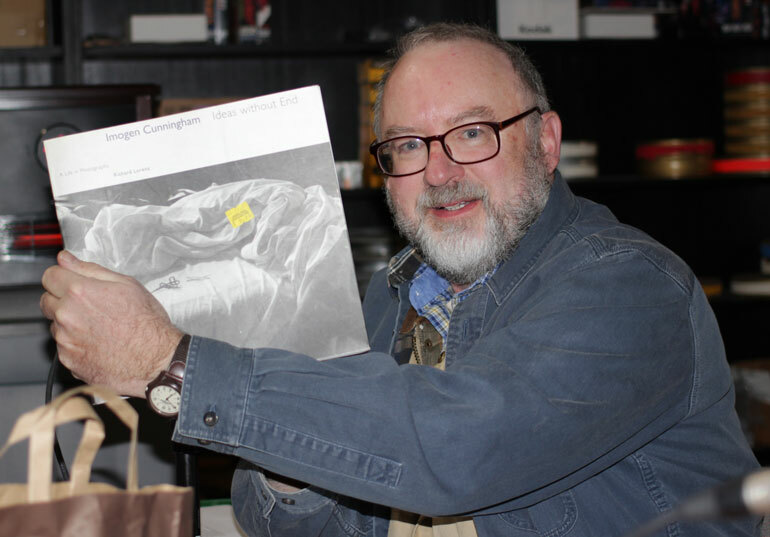 For several years now the Film Photography Project has been operating a successful School Donation Program. What is this program? It provides good used camera equipment to colleges, high schools, and elementary schools to support their Photographic Programs which often don't have the budget to purchase the cameras that are needed. What makes this program great? Well, there are two reasons! First is that it provides a perfect place to provide used gear a second lease at life especially when we photographers no longer have a need for them. Secondly, the joy that is provided to the students is something special. The fact that both Mark and Leslie are well aware of as they have had a chance to hand deliver these donations to the classes that would be using the gear. When it comes to equipment, no working camera is turned away, rangefinders, single lens reflexes, and point-and-shoots are all accepted and used. 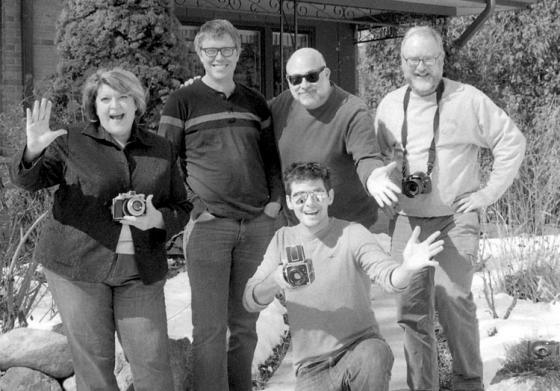 Even Mat sees the end results of this program as many students frequent MidWest Photo Exchange to stock up on film! If you want to know more about the school donation program, you can visit our website filmphotographyproject.com/donate/ for all the details and questions you may have! 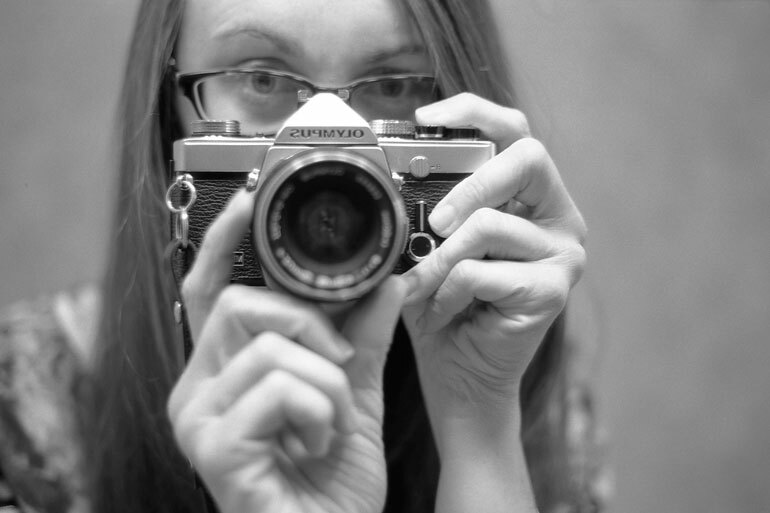 Self Portrait with the Olympus OM-1 by FPP Flickr Group member Kelsey. Visit her Flickr Photostream here. Leslie is a card carrying member of the Olympus fan club. And with good reason, Olympus is known for many cult cameras. But the camera she has with her today is something extra special. While the 35mm SLR had been established for many years, by the 1970s they were becoming, big, expensive, and loud. So Olympus decided to take a different approach. And in 1972 released the Olympus OM-1. The OM-1 was first known as the M-1, at least until Leica threw a hissy fit and the name was changed. The OM-1 would be referred to as the smallest, quietest, and Lightest Full-Frame 35mm SLR in the market. The primary goal was the make the camera fast, with the exposure controls arranged along the lens barrel with aperture, focus, and shutter speed all in a row. The camera sported a line of sharp OM-Zuiko glass with a range from fisheye to telephoto with a heavy preference to portrait focal lengths. And it was built to be a workhorse, Leslie used a pair to shoot weddings, as well as slide creation and duplication. The OM-1 is a completely mechanical camera with the battery running the match needle meter, and a proper on/off switch to keep battery drain to a minimum. Now the downside is that the camera is built around a 1.3V mercury cell, but installing a modern resistor to allow the camera to accept a 1.5V battery, or pick up an adapter from C.R.I.S Camera. These are perfect student cameras, and a fully outfitted OM-1 won't break the bank as many will pass these beauties over in favor of K1000s, AE-1s, and FMs, but don't let the low price fool you, this camera will give these iconic cameras a run for their money. What to give your summer vacation memories a special flavour? Why not capture them on Super 8! 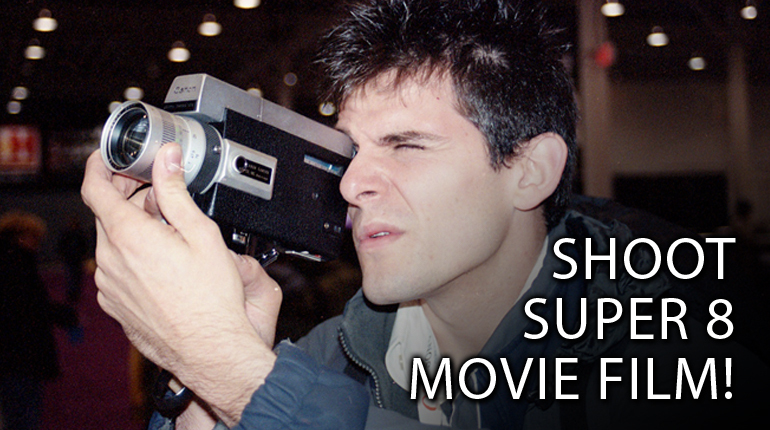 The Super 8 format has been used to capture family memories for years, and it's still waiting to do so today! There are plenty of solid cameras on the used market and tonnes of film stock. Michael suggests using a reversal film (slide film) so that you can get a Super 8 projector and show off your film on a projector screen as they were meant to be! You can head over to our Store and pick up all the film you'll need! Mark O'Brien's selection for this show is a beautiful retrospective on famous photographer Imogen Cummings. The book, Imogen Cummings: Ideas Without End. The book, authored by Richard Lorenz dives into Imogen's extensive portfolio, showcasing her work over her long and illustrious career. It covers work that includes portrait, landscape and still life. It's a fantastic addition to any photographic library, especially to those who collect the works of f.64 Group members. That's it for this show, but don't worry, we'll be back in a short two weeks. Until then be sure to check out the work from our amazing community in the Flickr Group. Have the urge to send us a letter, you can write to us by email podcast@filmphotographyproject.com or by regular post Film Photography Podcast PO Box 264 Fair Lawn, NJ 07410.